(Nanowerk News) Researchers from the U.S. Department of Energy's (DOE) SLAC National Accelerator Laboratory and Stanford University have designed a low-cost, long-life battery that could enable solar and wind energy to become major suppliers to the electrical grid. "For solar and wind power to be used in a significant way, we need a battery made of economical materials that are easy to scale and still efficient," said Yi Cui, a Stanford associate professor of materials science and engineering and a member of the Stanford Institute for Materials and Energy Sciences, a SLAC/Stanford joint institute. "We believe our new battery may be the best yet designed to regulate the natural fluctuations of these alternative energies." Cui and colleagues report their research results, some of the earliest supported by the DOE's new Joint Center for Energy Storage Research battery hub, in the May issue of Energy & Environmental Science ("A membrane-free lithium/polysulfide semi-liquid battery for large-scale energy storage"). Currently the electrical grid cannot tolerate large and sudden power fluctuations caused by wide swings in sunlight and wind. As solar and wind's combined contributions to an electrical grid approach 20 percent, energy storage systems must be available to smooth out the peaks and valleys of this "intermittent" power -- storing excess energy and discharging when input drops. Among the most promising batteries for intermittent grid storage today are "flow" batteries, because it's relatively simple to scale their tanks, pumps and pipes to the sizes needed to handle large capacities of energy. 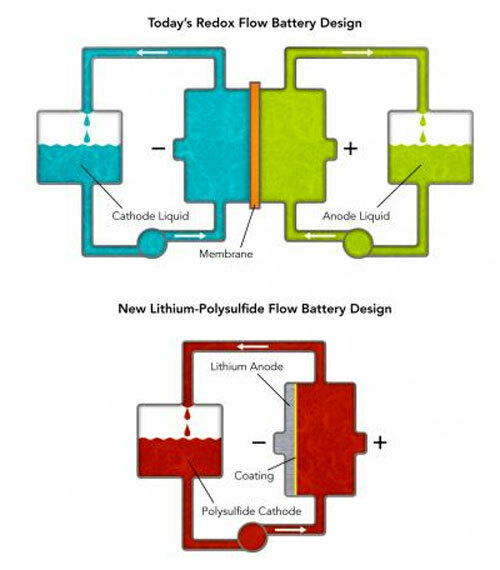 The new flow battery developed by Cui's group has a simplified, less expensive design that presents a potentially viable solution for large-scale production. In this video, Stanford graduate student Wesley Zhang demonstrates the new low-cost, long-lived flow battery he helped create. The researchers created this miniature system using simple glassware. Adding a lithium polysulfide solution to the flask immediately produces electricity that lights an LED. A utility version of the new battery would be scaled up to store many megawatt-hours of energy. "In initial lab tests, the new battery also retained excellent energy-storage performance through more than 2,000 charges and discharges, equivalent to more than 5.5 years of daily cycles," Cui said. To demonstrate their concept, the researchers created a miniature system using simple glassware. Adding a lithium polysulfide solution to the flask immediately produces electricity that lights an LED. In the future, Cui's group plans to make a laboratory-scale system to optimize its energy storage process and identify potential engineering issues, and to start discussions with potential hosts for a full-scale field-demonstration unit.